1. Boil the pasta until just done but still firm. Drain, reserving 60 ml (¼ c) of the cooking liquid. 2. Heat the oil and butter in a saucepan and fry the bacon until crisp. Sprinkle the flour over and stir through. Add the milk gradually while stirring briskly. Simmer until the sauce has thickened. 3. 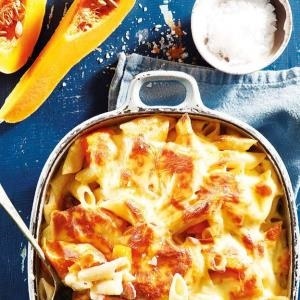 Stir in the butternut, half the cheese, the pasta and the reserved pasta liquid. Season with salt and pepper. 4. Preheat the oven grill. Transfer the pasta to an ovenproof dish and sprinkle the rest of the cheese over. Grill until golden brown and serve. TIP: Replace the butter nut with steamed broccoli or cauliflower or canned sweetcorn if you like.